I love OK Go, especially their fabulously innovative videos. And I love seeing how much thought and work goes into creating them. Every holiday season, hundreds of Christmas tree sellers from across North America descend upon the streets of New York City to ply their trade. Having left their homes and families behind, they endure the adversity of a migrant’s survival living out of their cars and vans. François, a “Tree Man” and father of three from Québec, returns to the same Manhattan street corner every year to deliver the magic of the season. Tree Man is his story. In A Doggone Christmas, internet dog sensation Just Jesse the Jack plays an amazing pup with telepathic abilities who has escaped a government facility and run straight into the loving arms of two young brothers. But the Washington brass won’t give up their secret weapon that easily, and with a no-nonsense special forces agent hot on the trail, the boys and their school buddies must hide the charming canine from helicopters and drones—and their mom and dad, who’ve forbidden them to have a pet. Can these kids, armed with only their wits, their bikes, and a strong bond with this special dog, save the day? We are delighted to present an exclusive clip. “A Doggone Christmas” stars Dominique Swain (“Alpha Dog,” “Magik”), Rib Hillis (“General Hospital”), Lauren Parkinson (“Avengers Grimm”), Paul Logan (“Sniper: Special Ops”) and introduces “Just Jesse the Jack” Russell Terrier, as well as child stars Jolie Ledford, Walker Mintz, Jonathan Tysor, Jayden Hedden and Dilan Patton. Just Jesse the Jack is a YouTube favorite with over 17 Million views on his own web channel. “A Doggone Christmas” will be his first movie and the start of a new franchise, with “A Doggone Hollywood” currently in post-production, and “A Doggone Mystery” currently in development, both set for release in 2017. 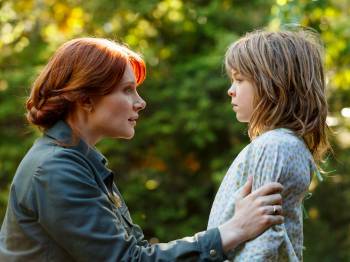 Bryce Dallas Howard stars in “Pete’s Dragon,” out on DVD/Blu-Ray this week. I had a lot of fun talking to her about making the film. Your character’s deep love for nature is a very important part of the film. Tell me about her. I play a woman named Grace and she is a Park Ranger. You don’t really know exactly when it takes place but it takes place before cell phones were around certainly, maybe in the early 80’s. And I find a little boy in the forest who inexplicably is alone. And he looks like he has been living there for a long time and it is my character’s job to figure out what happened and to simultaneously protect this boy. And what was amazing about shooting this film kind and the tone of it overall is that because it did take place a while back before we all were so attached to devices and because so much of it was shot in the woods, it was a really healing experience for me personally and I think when folks watch it it’s soothing. It is a very emotional film and a beautiful film but it is very soothing as well and I think it is because so much of it takes place in nature. Talk to me a little bit about working with Robert Redford. That must have been pretty magical too. Oh my, it’s awesome. He is the real magical creature of this movie. 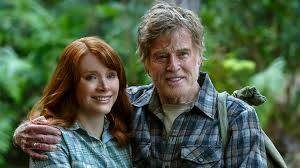 Okay, Elliott is magical and Robert Redford is maaaaaagical. I’m always going to think back to and kind of pinch myself. He is a very cool guy and I would’ve been super intimidated being around him but he is just so chill and pleasant that you are immediately put at ease in his presence. And he himself is, as you would imagine, an incredible storyteller and so it endless fun talking with him because he’s the most interesting person I’ve probably ever met. In that early scene, where he is telling the children that story, I thought you couldn’t find a better way to completely captivate the audience. I know you spend a lot of time on movie sets when you were growing up. What did you learn from that that really has helped you as an actress and. now that you are directing too, as a director? Honestly everything. Because in most art forms there is some system of kind of mentorship, and apprenticeship and that is how it’s been going on for thousands of years. When it comes to a medium of arts. I think that tradition is — not that it’s lost but it’s not something that’s a huge part of this industry anymore. And I feel like I am so lucky, given that this is now what I do for a living, when I act and direct and write, I feel so grateful that I got to just spend all this time growing up on set, doing odd jobs, watching and learning, asking questions. I had over 20 years of that before I was in a movie and I remember all of it. So, it was something that I feel so lucky about because there is so much trial and error when anyone is creating anything. And to have been able to observe my dad at work and the folks that he worked with and see such a great example of collaboration, teamwork and work ethic, that is something that I definitely apply to everything that I do. At the end of the day that is what a director’s role is, to see the big picture and to create an environment where everyone is going to be able to bring all their talents and abilities to the table and then they go away and they kind of build the house. And I think that is part of what is so exhilarating and exciting about the creative process. 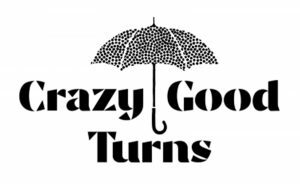 As it’s coming together you don’t necessarily know what the end result is going to be like and yet you’re with a group of people you trust and admire and look to to contribute. That’s what is so electrifying and that’s the magic of the creative process. What I took away from both experiences is that technology is getting better and better, more and more rapidly, especially visual technology. It’s so exciting to get to be privy to these huge strides forward. The first “Jurassic Park” was game-changing in a world of visual effects and practical effects and really ahead of its time, but nowhere near what we can do now. We are in such an exciting place right now because there are these leaps like that being taken all of the time and new technologies that are getting integrated into the creative process and new approaches. For someone who is curious and likes to learn new things, which is who I am, this is the best time to be around. I am so excited.